US Blaster reference component kits incorporating state-of-the-art loudspeaker technology. They feature Nomex and silk cone, Kapton voice coils and powerful high-density Strontium magnets with base plates. The extremely strong magnetic field ensures a crisp and dynamic sound. However the mid and high frequencies have not been neglected. 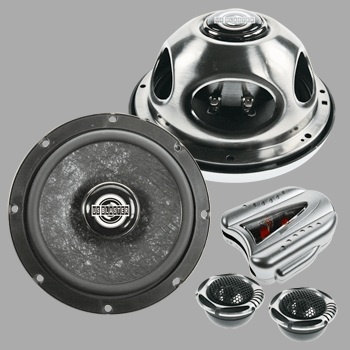 For these sets, we have specially designed new powerful Neodymium tweeters. A set of grills and a crossover complete the system.